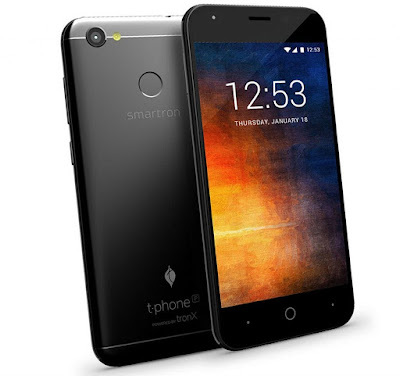 Smartron has launched t.phone P smartphone in India. It features a 5.2-inch 2.5D curved glass display powered by Snapdragon 435 SoC with 3GB RAM and 32GB of internal storage. Dual SIM device runs Android 7.1.1 (Nougat) with support for tcloud, tcare and tstore as well as tronX’s assistive and predictive AI. On Camera, it has a 13-megapixel rear camera with LED flash and a 5-megapixel front camera. Smartron T.phone P comes with a metal back, has a fingerprint sensor on the back. Packed with a 5000mAh battery that promises up to 2 days battery life on a single charge. Commenting on the launch, Amit Boni, Vice President Sales and Marketing, Smartron said, The tphone P is inspired by the multi-faceted, on the move, globally aware Indian consumer. This is a person who expects more from his phone without any compromises and without stretching the seams of his pockets. With a massive 5000mAh battery and an all-metal body, we’ve merged power and beauty into the tphone P. To top it, we have layered it with Qualcomm Snapdragon 435 processing might to give millions of Indians an enviable device at an exceptional price. Ayyappan Rajagopal, Senior Director – Mobiles at Flipkart said: We are glad to launch the tphone P exclusively on Flipkart and are happy to expand our customers’ choices in the budget/pocket-friendly segment. The new phone checks all the right boxes offering customers best-in-class technology and design at affordable prices. We are determined to bring customers more innovation, superlative choices and a richer experience to constantly keep them excited and maintain our market leadership in this segment. Smartron tphone P comes in Black color, is priced at Rs. 7,999 and will be available exclusively from Flipkart starting from January 17.